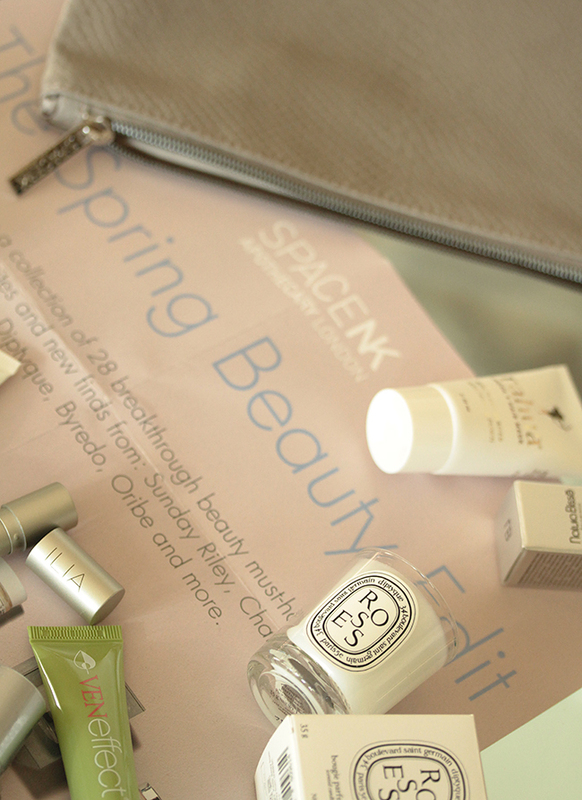 I am so thrilled to share that SpaceNK, the ultimate destination of luxury beauty products, launched their highly anticipated Spring Beauty Edit! Spend $275 and score a gift with purchase that is worth over $500 with the code SPRING18. 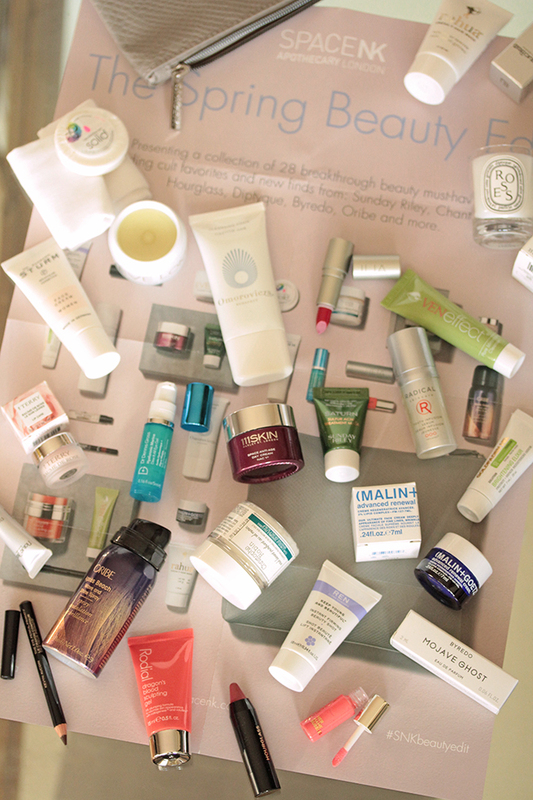 It's a rare opportunity to discover an exclusive curation of 28 beauty breakthrough must-haves from Sunday Riley, Diptyque, Byredo and not a single foil packet which I appreciate very much. I'm very hesitant to try new skin care since my Epiduo Forte topical acne treatment has finally started to make visible progress. 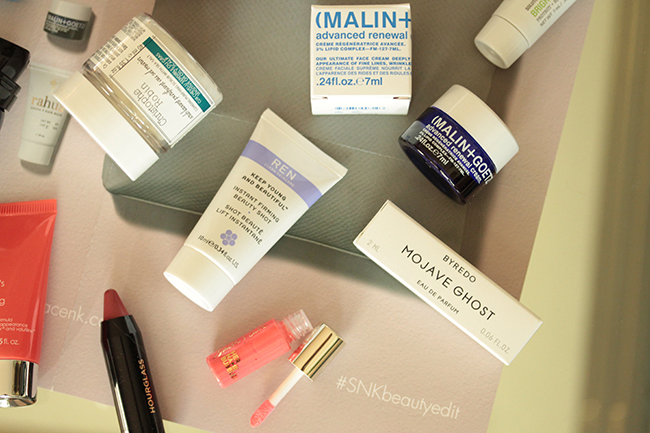 But the Spring Beauty Edit offer encouraged me to revisit products I once enjoyed and also try something new. My skin care philosophy is fairly simple now as I've become more conscious of protecting my skin. Buy less, but buy the good stuff. I no longer do the whole korean inspired ten step routine because my skin is so easily freaked out and any time I react badly to a product, I'm stuck repairing the damage in the form of scarring for six months. Most of you know by now how much I love 111SKIN. 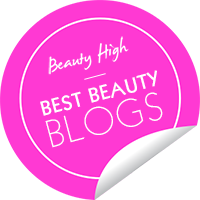 This brand has a cult following with good reason; their clear gel textures are divine and truly incomparable and I only have SpaceNK to thank for introducing me to the Space Defence Bright Eye Lift Gel via spring edits from long ago! It not only fills but lifts the fine lines under my eyes, and I thank this eye gel in particular for my "youthful" eyes aka no crow's feet. It also minimizes puffiness, which is a huge problem for me because my face is prone to bloating. I've used up four bottles now, and though I try other eye creams, I always come back to this eye gel when I want my eyes to look their best. Since I was so head over heels, I wanted to explore the facial serums and discovered my winter skin savior the Y Theorem Repair Serum which I have already mentioned as one of the most potent efficacious hydrators I've ever tried. My skin had wind burn from snowboarding in Vancouver and was extra dry from using Epiduo every night mid-December, but 111SKIN came to my rescue. I use two pumps when my skin is suffering and 1 pump when my skin is dry but not in peril. This stuff is liquid gold except it's perfectly translucent! I love the rich yet silky texture that my skin drinks up. I think the results are most noticeable after three or four days, when the cells are regenerating rapidly and in turn makes my cheeks look bouncy and skin smooth. Let's move onto some new finds! 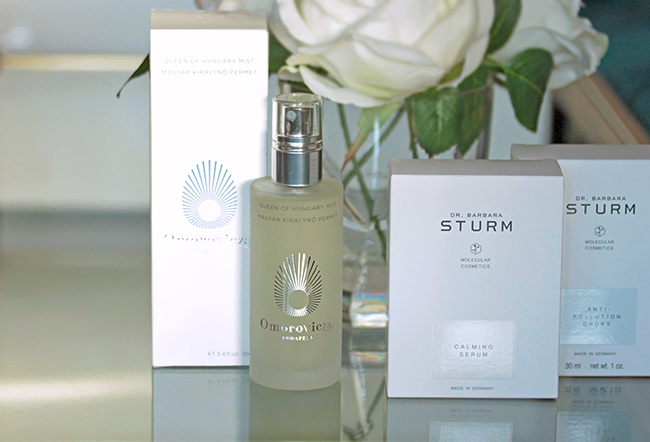 I have been loving the Dr Barbara Sturm Calming Serum because it has improved my redness. Despite the fact that the formula is not oil-free, it never clogs my pores. The hydration effects are actually long-lasting and it has a very soothing milky texture that never stings or inflames my acne. It replenishes my skin in a way that most skin care cannot. Yes, it's a whopping $250 for a serum but I only need a dime sized amount to cover my whole face. While I can't say that I have seen my scars shrink in size, they're definitely less deep, less "angry" red so that's something to celebrate. 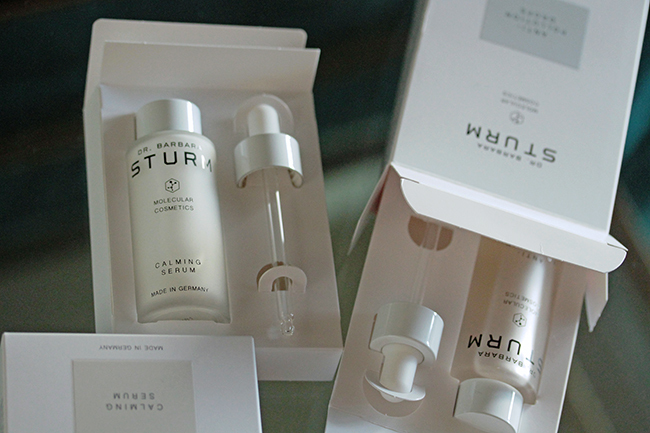 And freshly launched are Dr. Sturm's Anti-Pollution Drops which I plan to start mixing into the Calming Serum to combat oxidation and inflammation caused by pollutants. My sister adds her to the Dr Sturm Super Anti-Aging Serum and she swears she saw a difference in a few days! Bye bye blackheads and dullness. The Anti-Pollution Drops haven't appeared on SpaceNK.com yet but they should soon. 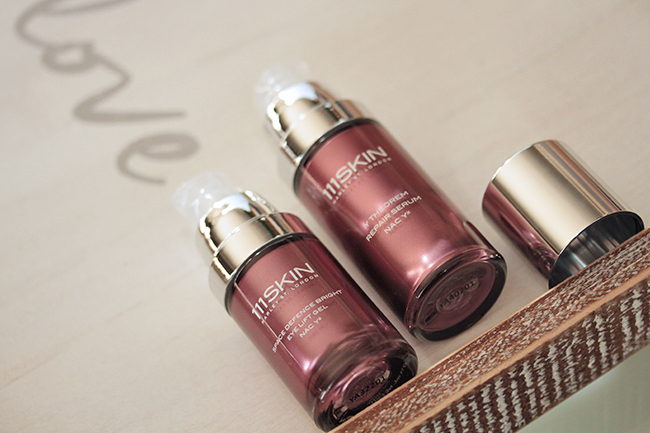 Now, I always get asked these questions so if I had to pick just one serum I would still go with 111SKIN. 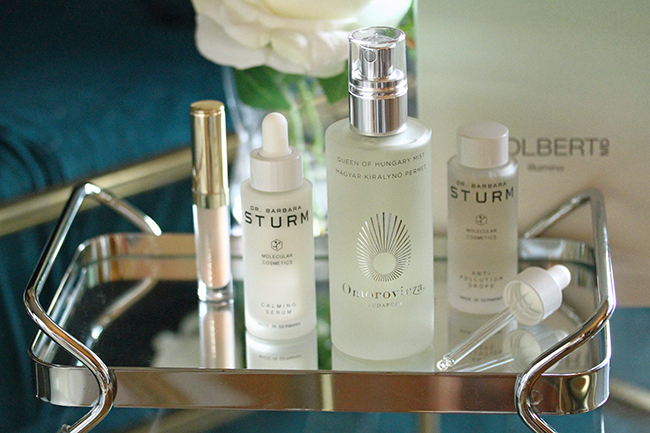 Barbara Sturm's skin care is worth every penny but 111SKIN has made a positive impact on my skin for years now. I can't abandon ship just yet, but both are indeed my most coveted skin care brands at the moment. Next up is a sleeper surprise dedicated to my sister. She noticed recently that I had stopped using toner and asked why. I got bored and there wasn't anything I was drawn to repurchase. 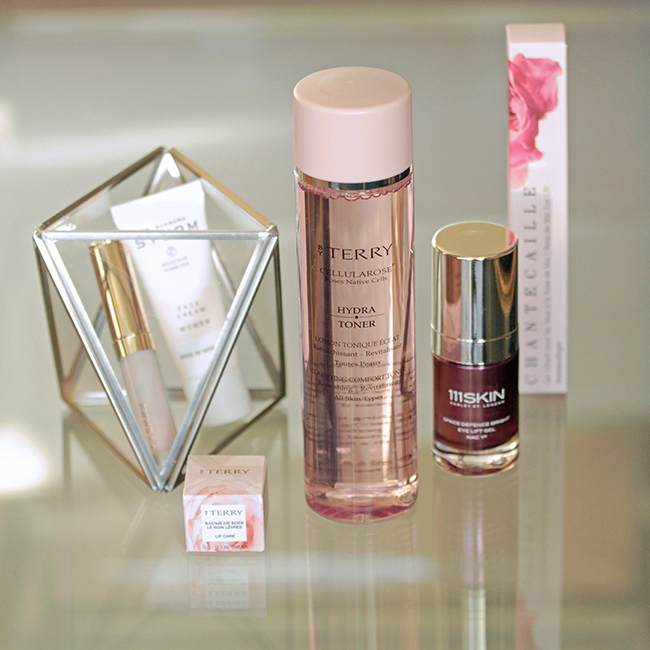 Since my skin has been extremely dry lately, we decided to give the By Terry Cellularose Hydra-Toner a whirl since I adore By Terry's makeup and all things rose. This clarifying toner is not new, and now I'm kicking myself for not trying it earlier! It smells like heaven — bright and fresh, not overpowering —and it cleans, brightens, and hydrates so well. Give it about 30 seconds to dry down before applying serum. 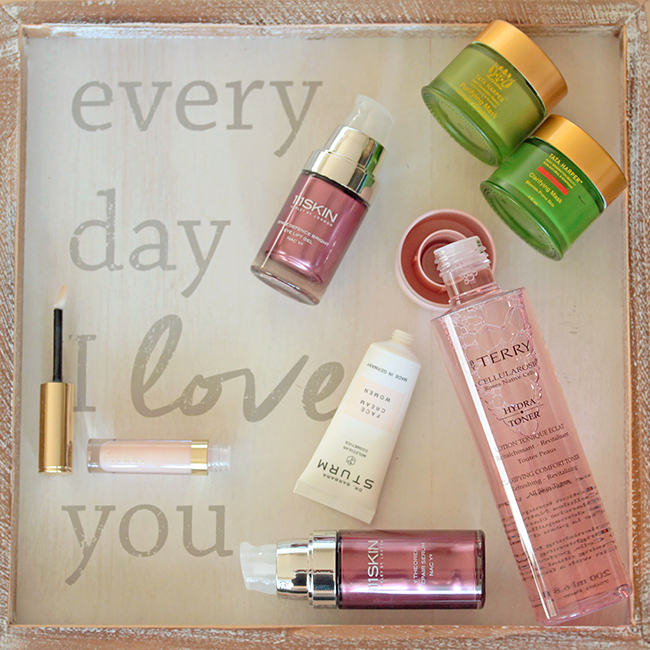 I haven't had much luck with By Terry's other skin care products other than the Baume de Rose Crystalline so when I recommend this, it's because we found it exceptional. Let's come back to a product I remember trying years ago. When Omorvicza launched stateside, I treated myself to the smaller travel sized bottle and loved it because at the time there were so few noteworthy mists on the market. I, however, gave it to my grandmother to use as a toner since she has an aversion to cotton pads. But I have been reunited with the Queen of Hungary Mist, and it is still one of the best! I maintain that my holy grail is the Chanel Hydra Beauty Essence Mist because the spray dispenser is set with the perfect amount of pressure yet Omorvicza's is a close second. Both have very fine mists, but the Queen of Hungary is a touch gentler with less product released plus you get double the fl. oz price for the same price! I spritz it on throughout the day as a pick-me-up to pamper myself. Last but not least we have my favorite sheet masks! I've used so many over the years from traditional Japanese brands to cheap novelty printed kinds but if you're looking to reduce hyperpigmentation, look no further. 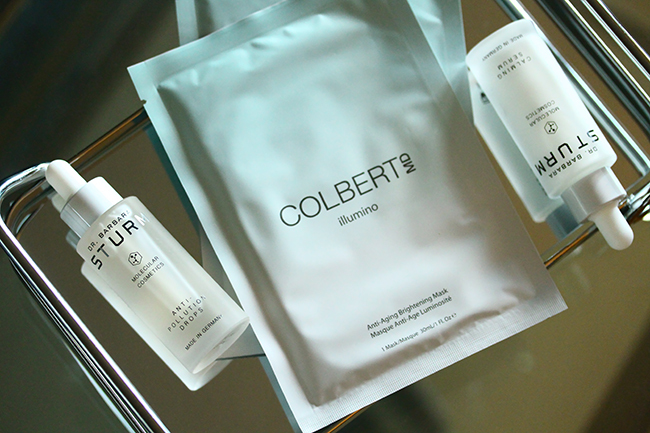 The Colbert MD illumino Anti-Aging Brightening Mask has eyelid covers and utilizes a thick non-gummy biocellulose so that the mask stays put on the face. 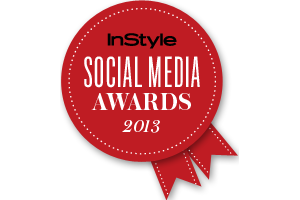 After twenty minutes, my complexion appears noticeably brighter, hydrated, plumped and more even-toned. I normally take the leftover serum in the pouch and apply it to my neck and down my chest, on my elbows and knees, as well as my hands. So generous, no skimping! The illumino masks are best refrigerated for 30 minutes because it then cools and de-puffs without any uncomfortable tingling. P.S. If sheet masks aren't your jam, then do try Tata Harper's Clarifying Mask. Even if you don't have acne, it has a mild enzymatic exfoliation effect that will leave your skin clear and glowing and comfortable. It applies like honey but washes off easily and is a wonderful mask for even oily skin. No tautness or dryness, and no scaring your children and/or neighbors! 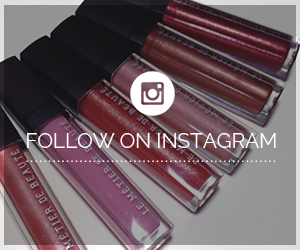 Do take advantage of the Spring Beauty Edit offer to stock up or splurge! 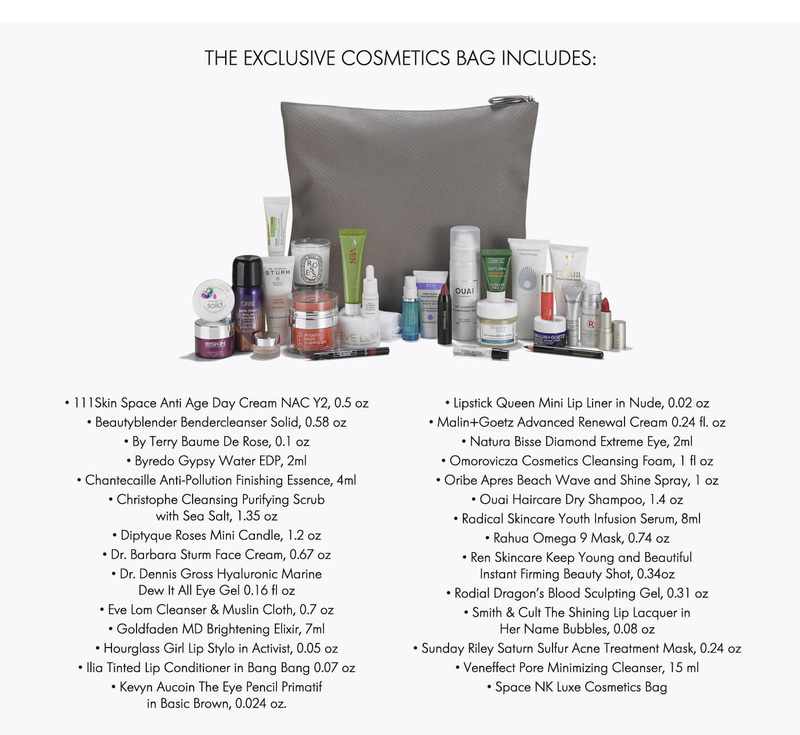 I normally don't bother with GWPs from other retailers but this goody bag comes packed with travel-sized essentials that I actually love and am impressed by. Plus I think my recommendations are pretty spot-on for the season. Swing by a SpaceNK near you or order online to join in on the sample sized fun, available until stocks last!